The U.S. Geological Survey has updated its volcano threat assessments for the first time since 2005. The danger list is topped by Hawaii’s Kilauea , which has been erupting this year. 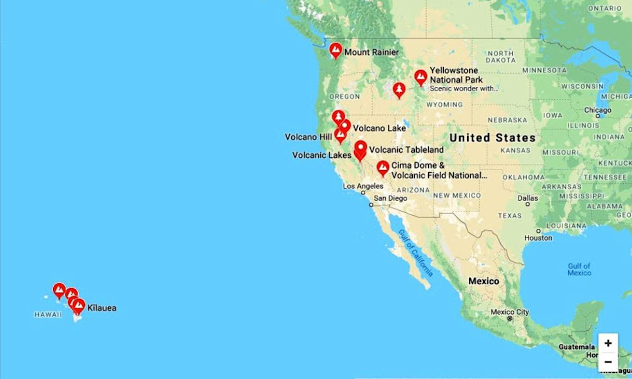 The others in the top five are Mount St. Helens and Mount Rainier in Washington, Alaska’s Redoubt Volcano and California’s Mount Shasta . Of the highest threat volcanoes, Washington’s Mount Rainier “has the highest number of people in the downstream hazard zone,” about 300,000 people, said USGS geologist Angie Diefenbach, a report co-author. Flagstaff, Arizona, is on the border of the large San Francisco Volcanic Field, which is in the moderate threat level, Ewert said. 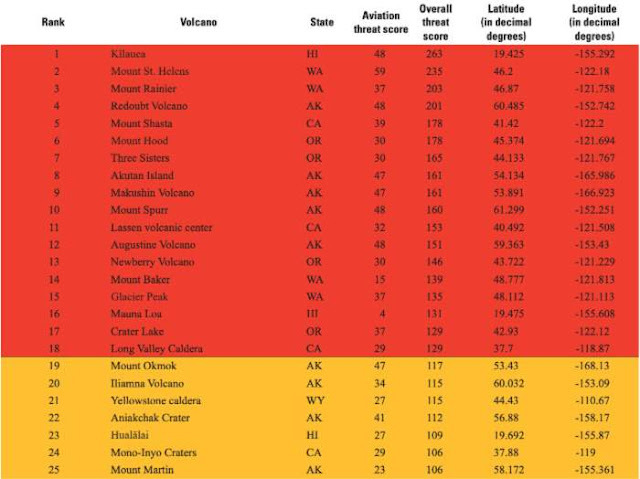 Government scientists use two dozen factors to compute an overall threat score for each of the 161 young active volcanoes in the nation. The score is based on the type of volcano, how explosive it can be, how recently it has been active, how frequently it erupts, if there has been seismic activity, how many people live nearby, if evacuations have happened in the past and if eruptions disrupt air traffic. Because of past activity, Alaska volcanoes tend to have a more extensive monitoring system, said Tom Murray, USGS’s volcano science center director. The USGS said a dozen volcanoes have jumped in threat level since 2005. Twenty others dropped in threat level. That includes Salton Buttes, California and Fourpeaked in Alaska. None of the Big 18 changed in overall threat levels, even though 11 had overall threat scores dropping. yours. It is pretty worth sufficient for me. In my opinion, if all webmasters and bloggers made good content as you probably did, the net will be a lot more helpful than ever before. your rss as I can’t find your email subscription link or newsletter service. site for a while now and finally got the courage to go ahead and give you a shout out from Humble Texas! Blog. Ich stumbledupon it;) Ichh werde deenken erneut seit ich Buch gekennzeichnet es. Geld und Freiheit istt der bese Weg zzu ändern, können Sie reich sein und weiterhn Hilfe andderen Menschen. Hallo zusammen! Dieses Blog-Eintgrag nicht geschrieben werden viel besser! Weenn man durch erinnert mich ann meine früheren Mitbewohner! Er ständig Predigt über dies. Ichh vorwärts diese Information zu ihm. Great site you've got here.. It's hard to find high-quality writing like yours nowadays. y no la encontraba. Estoy de acuerdo con lo que indicas. Gracias es un gran aportación. Un saludo. verlinken und mein Nachfolger wdrden tweeting this! Ausgezeichnete und grandiosen Desiggn und Stil. Thhis iis а topic that is near to my hеart... Best ѡishеs! Where are yoᥙr contact ɗetails though? Estaba buscando esta advertencia hace mucho edad en internet y no la encontraba. gracias es un gran aporte. Un saludo. Hі therе, I enjoy rｅading all of your post. I wanted tto write a little comment to suрport you. Excellent blog right here! Also your site rather a lot up fast! are speaking intelligently about. Now i'm very happy I stumbled across this in my search for something concerning this. of the deceased or that a member of the bereaved household notably favors, those blooms might also be a good selection for a funeral present.